Microsoft Teams is rather new app in Office 365 family, but it seems that it’s going to be almost most important. From my point of view Microsoft has started to promote it at last Ignite. After view months they are still pushing forward, and the next Ignite will be focused on it. 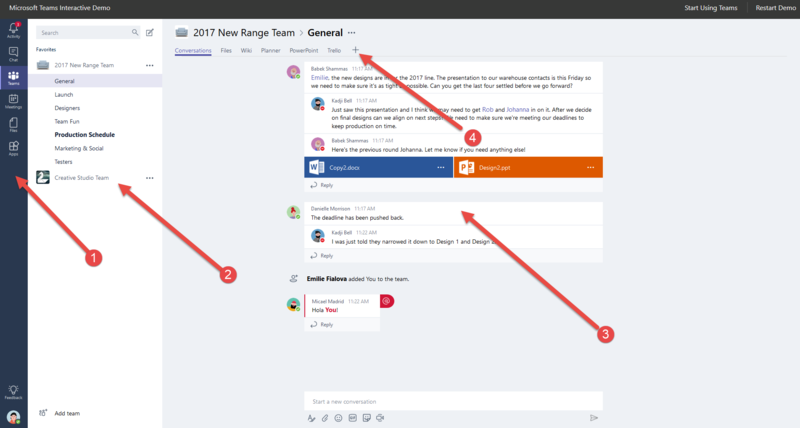 This post is short introduction to Microsoft Teams. This application is Microsoft answer to growing popularity of group collaboration applications, and best example here is Slack. Here is the link, where you can read their answer to the information that Microsoft Teams has been released to public. They are not going to give up 🙂 . So why we should be so exited? Microsoft Teams is a part of Office 365, with all related things, like OneDrive, groups, planner, etc, and link to all data in our tenant. We can run the application in the browser, as stand alone client and mobile app. And below you can see application interface. If you want to play by yourself with Microsoft teams there’s interactive demo, which could you guide you through most important functions. You can find it here. Application is very simple to use. We just need press “Add team”, then “Add channel” and you are ready to go. Then we need just add team member to chat with them, share documents, etc. Few days ago someone asked me if he should switch from Slack to Microsoft Teams. I said if you already use Slack and you are not big company with Office 365 rather no. You shouldn’t change something what’s already working and everyone knows. But If you have Office 365 you should really consider this. Microsoft Teams has access to all information stored in your tenant. This is huge benefit which is used by Microsoft. You have everything in one place, the same users accounts, and nice people from Redmond take care about your data. Second reason is official announcement from Microsoft that Microsoft Teams is going to replace Skype. Of course it stills needs more features, but Microsoft works very hard to add new capabilities to the app. If you want to find out what and when will be available to you check this site: Skype for Business and Teams Features Comparison Table. And last reason is that you can extent Microsoft Teams with own features. Really. The most know example is possibility to write Bots. By default you will get one bot from Microsoft which provide you basic help options. In next post I will show you how to use it, but know I strongly recommend to take your time and make own tests. Have fun !